"We're one, but we're not the same, we have to carry each other..."
The title of this week’s episode may specifically be about losing one’s voice, but in “Laryngitis” we saw three main characters lose a key part of themselves and watched how each of these characters dealt with the bigger issues surrounding that loss. Mr. Schue’s right when he says that the glee club has lost its voice, and by getting each member of the club to sing a solo that represents how they see themselves right now, we get a good look inside these kids’ struggles outside of the group – an idea that I always find interesting within this show. 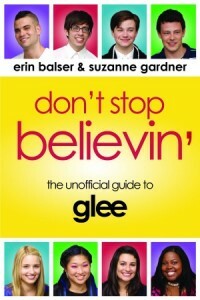 If only we had gotten a snippet of the solos performed by the other gleeks! The focus this week was on Rachel, Puck, and Kurt, however, so let’s look at how the concept of loss affected all three of them. Rachel struggled with losing her voice this week, and she explained the symbolism behind this loss very clearly: Who is Rachel Berry without her voice? For Rachel, being a singer is her number one purpose in life, her true reason for being. Sure, it seems somewhat over-the-top for her to feel at such loose ends over what’s bound to be just a brief illness, but it makes sense for Rachel. As we saw last week with her “Run, Joey, Run” video, Rachel will do whatever it takes for her stardom, even alienate herself from the people she loves, so the fear of losing her ability to sing would understandably be completely terrifying for her. So while this story line made sense as a concept, the execution was a bit mixed for me. I love how Rachel learned to understand that there are people worse off than her and that losing her voice wouldn’t be a death sentence, but why did Finn need to introduce her to his paralyzed friend to prove this point? Why couldn’t they have used Artie to illustrate the exact same idea? Yes, this lead to a cute “teaching him how to sing” scene which obviously could not have been done with Artie, but it was frustrating to see a guest star perform pretty much the same role that a main character could have played, especially a main character who is sorely underused. Nonetheless, good on Finn for trying to help Rachel (even if it was just a ploy to get into her pants), and good on Rachel for actually learning an important lesson through her loss-induced hysteria. "I'm sorry that you, seem to be confused, he belongs to me..."
Also dealing with loss this week was Puck, who physically adjusted to the loss of his Mohawk and psychologically adjusted to the loss of his status and bad boy rep. And although like Rachel he struggled with this unwanted loss, it was interesting to see that while Rachel worked to learn from this incident, Puck basically spent the entire episode trying to dig himself out of his unpopular hole, and based on the nerd dumpster tossing scene at the end, it seems he didn’t learn anything in the process. Dating Mercedes was merely a ploy to climb back up the social ladder and you could clearly see how much he was loving Mercedes and Santana fighting over him in “The Boy is Mine.” At the end of the episode when Mercedes talks to him about the importance of being true to who you are, there was a slight glimmer of understanding in Puck’s eye, but it seems like that’s all we repeatedly get from him: brief fleeting moments of nice guy potential that are quickly ruined by nerd dumpster tossing. It would’ve been so much more interesting to see Puck suffer at the bottom of the McKinley High food chain for more than just one episode and to see him really cope with this situation. "Everything's coming up Kurt! 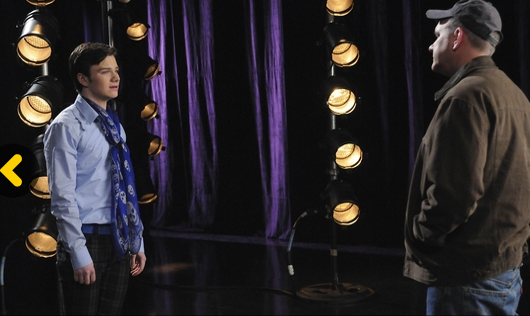 Everything's coming up Hummel!" The most interesting use of the loss motif this week was Kurt’s attempt to lose his gay image as a reaction to his fear of losing his dad. Out of the three characters suffering with loss this week, Kurt is the only one who actually chooses to lose something important to him, and out of all three characters, Kurt’s loss is definitely the most substantial. By spending a few days singing to Mellencamp, dressing like a trucker, and making out with Brittany, Kurt loses sight of his true self by sacrificing his own wants and needs just so that he can establish a greater bond with his father. And while I thought it was really interesting to see Kurt go to these lengths for his father’s love (side note: I’d be very happy to never see Kurt sing in his butch voice again though, thank you very much. ), by the end of the episode I wondered what it had really accomplished. Haven’t we seen Kurt and Burt talk about their love for each other multiple times? Like in “Home?” And in “Wheels?” And in “Preggers?” I love these two, but I’m starting to find their story lines repetitive. Once again the multitude of musical numbers strongly dominated the episode, but I think that each song really fit well into the story and thus I’m willing to let it slide. “Jessie’s Girl,” “Rose’s Turn,” and “Lady is a Tramp” were all fabulous and kudos to their male singers for stepping up rather awesomely this week. 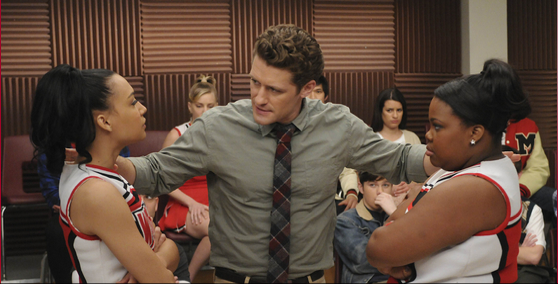 Although I’d be remiss if I didn’t point out frustrating it is that Mr. Schue was completely okay with Finn blatantly dealing with his issues through song in “Jessie’s Girl”, yet he chastised Rachel for doing the same thing with “Gives You Hell” in “Hell-O.” Stop being such a hypocrite, Will! Favourite moment: It’s three-way tie between “Jessie’s Girl,” “Rose’s Turn,” and “Lady is a Tramp.” All three songs were incredibly entertaining and all three guys knocked them out of the park! Next week: Joss Whedon directs and NPH guest stars. There are no words to describe how freakin’ beyond excited I am. My favorite storyline was Kurt’s. Yes we heard his father say he acceptes Kurt in Preggers, but the thing is, real acceptance and the building of a strong bond can only come with time. One thing is to say “I accept you because I love you” the other is really stablish a bond and comunicating with each other (I love my mother but I can not talk with her and I’m 29). What I think Glee is doing is making a conservative father and his gay son relationship develop beyond acceptance and into a real friendship and that is jus BEAUTIFUL. Burt in preggers accepted his son, tough he showed in Wheels he was not ready to deal with the prejudice yet, in Home he reassured Kurt of his love while searching in Finn an unfufilled dream he had for Kurt. In Laryngitis they really comunicate and open their heart about their frustrations to one another (while in preggers was like “it’s all good, no problem” which is not REAL. Laryngitis is “It’s not good all the time, and yes it is hard. But we will work this out somehow”) . We can see their bond strenghtening and to a homophobic world there could be not a better message then a forming friendship between a conservative father and his gay son. Chris Colfer just amazes me, give that kid an award already. Rose’s turn gave me chills it was so good. I have to agree with your analysis of Kurt’s story. Overcoming the gay issue with parents is far more complex than a lot of people realize. I’m 36, and I still feel like we don’t really communicate on that subject at all, even though there’s plenty of love. I really am so excited to see this tough and important issue get some real play in TV lately. (see also “Ugly Betty”, RIP) Coming out is only the beginning. Anyway, I was blown away by “Rose’s Turn”. It was definitely my favorite of his since “Defying Gravity” — actually nope…it was better than DG. He’s a star.